Submitting images: When submitting images to TA please send them as an e-mail attachment and please try to use the following filename format: object_yyyymmdd_hhmm_observer.jpg where object is the name of the object, yyyymmdd, hhmm is the date and time of the exposure (the hhmm field is optional) and observer is a unique observer code (say your initials). 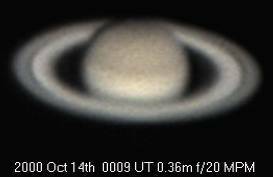 It is also a good idea to include details of the telescope, scale, orientation, camera, filter etc as annotation on the image. 1999 August 21. 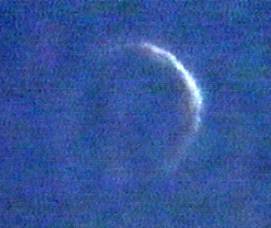 This image of Venus was taken one day after inferior conjunction. 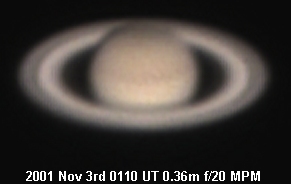 The seeing conditions were terrible due to the proximity of the Sun and this is the best frame from a 20 minute long videotape! Nick James. 1999 May 27. 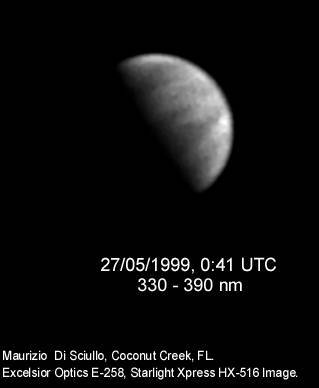 This is an extraordinary image of Venus in the UV obtained by Maurizio Di Sciullo, Coconut Creek, Florida. 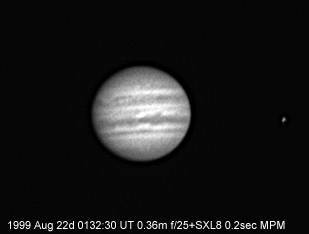 He used an Excelsior Optics E-258, a Starlight Xpress HX-516 and a filter with a passband of 330-390 nm to obtain this image. 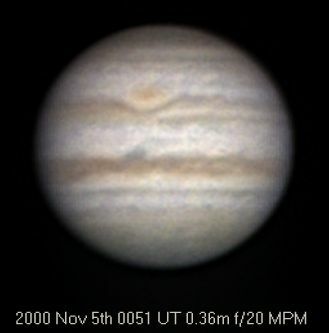 1999 April 17, 0032UT (CM=209). Terry Platt, 318mm Quad-Schiefspiegler. 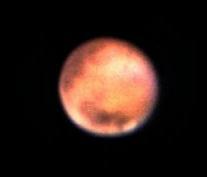 This image shows the Elysium region near centre, with Nix Olympica at the evening limb (left) and Mare Cimmerium across the upper part. The very small North polar cap is at bottom. 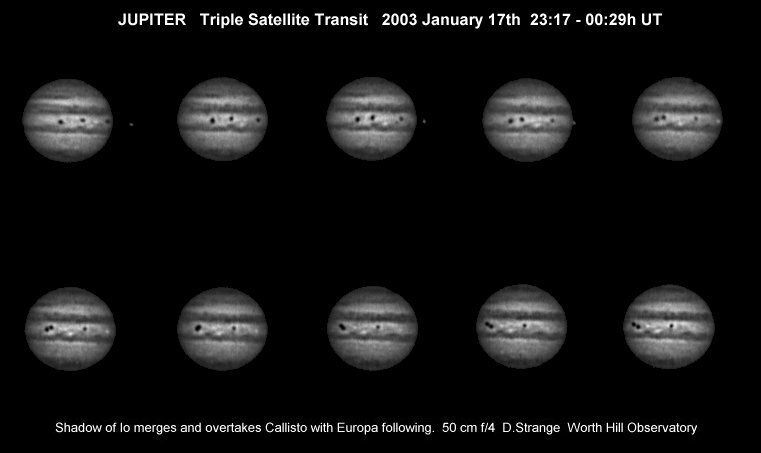 Composite of 1999 images by Terry Platt. 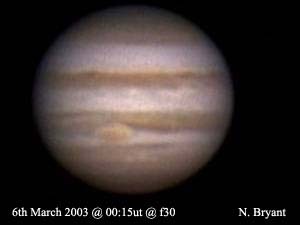 1997 April 12, 2235 (CM=78). Terry Platt, 318mm Tri-Schiefspiegler. 1997 March 21, 2306 (CM=278). 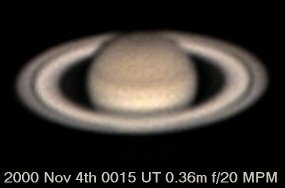 David Strange, 50cm, f/4 + x2.5 Barlow. 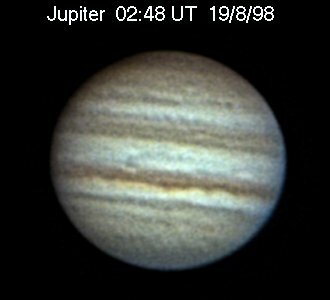 1997 March 10, 2351 (CM=25). Terry Platt, 318mm Tri-Schiefspiegler. 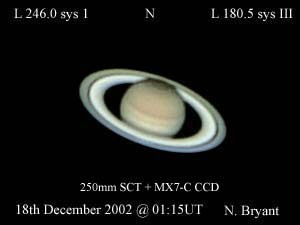 2003 January 17 (Strange). 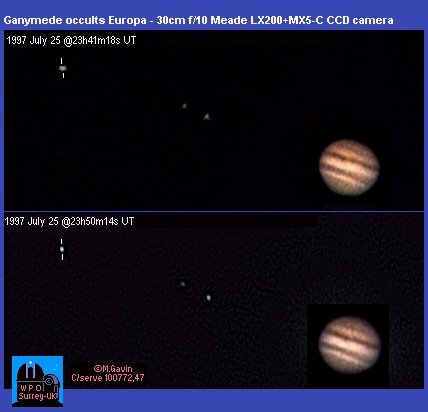 Shows multiple satellite events. 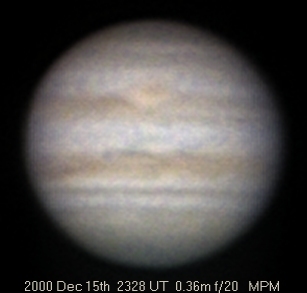 2001 December 29, 23:07 UT with the 0.36m f/20 Cass and MX5c CCD, Cockfield, UK. Exposure was 0.05 sec. Longitudes are w1=281.7; w2 = 99.9. 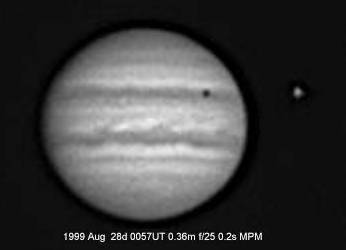 As well as Io's shadow, Io itself is visible as a white blob immediately to the right of the shadow (4 minutes of time behind it). (Mobberley). 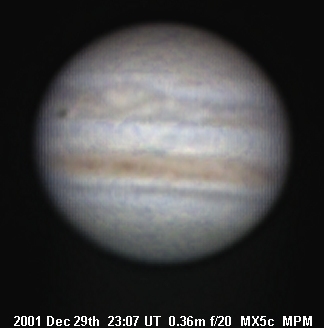 2001 December 15, 01:48 UT, exp 0.1 sec, w1=169.2, w2=101.0, MX5c colour CCD camera, 0.36m f/20 Cassegrain (Mobberley). 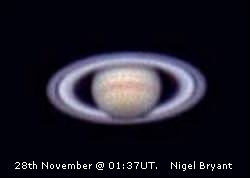 2001 November 24, Nigel Bryant. 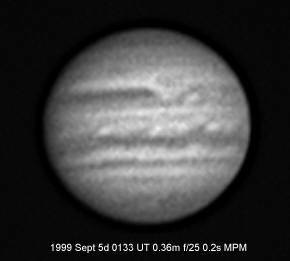 2001 November 3, 0236 UT, exposure 0.1 second, MX5c CCD; W1 = 41.8 ; W2 = 293.6, 0.36m f/20 Cassegrain. 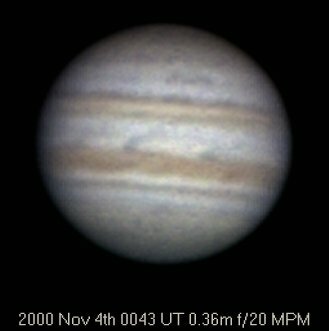 2000 December 15, Some less-than-atrocious seeing allowed another Jupiter image to be taken last night at 2328 UT (W1 = 247.9, W2 = 77.8). 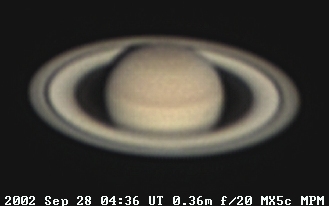 This was the only decent image out of some 600 taken over a 2 hour period. 2000 November 5, 0051 UT. 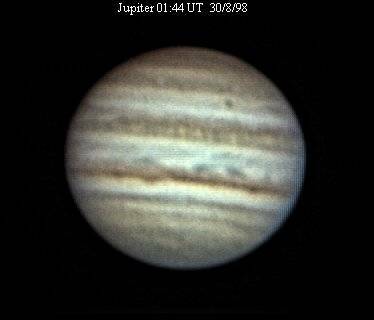 The Great Red Spot region was nicely presented. 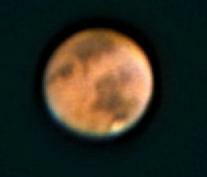 0.36m f/20 & MX5c; 0.2 sec exp; W1=299.2; W2 = 81.4. Martin Mobberley. 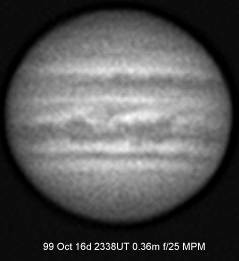 2000 November 4, 0043 UT, exposure 0.1 second, MX5c CCD; W1 = 136.3; W2 = 286.2. 0.36m f/20 Cassegrain. Martin Mobberley. 2000 October 14 0031. Martin Mobberley. 2000 October 1 0359. Terry Platt. 2000 October 1 0143. 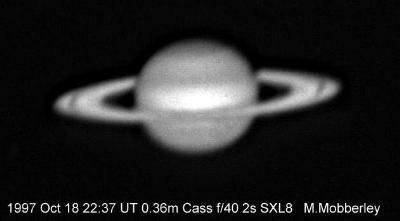 Martin Mobberley, 0.36m, f/20 Cass, 0.05sec, MX5-C. System I = 200.4, System II = 249.5. 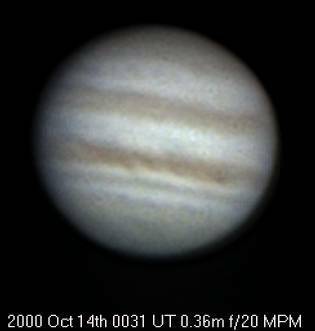 1999 October 16, 2338. Martin Mobberley, 0.36m, f/25 Cass. 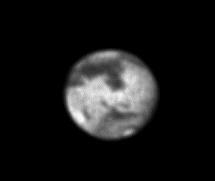 0.2sec, SXL8 CCD. System I = 342.4 System II = 182.3. 1999 September 5, 0133. Martin Mobberley, 0.36m, f/25 Cass. 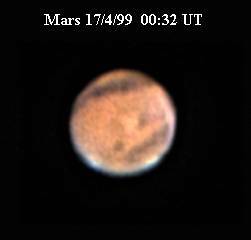 0.2sec, SXL8 CCD. System I = 255.0 System II = 55.1. 1999 September 4, 0126. Martin Mobberley, 0.36m, f/25 Cass. 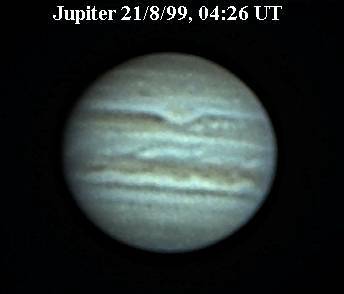 0.2sec, SXL8 CCD. The satellite is Io. 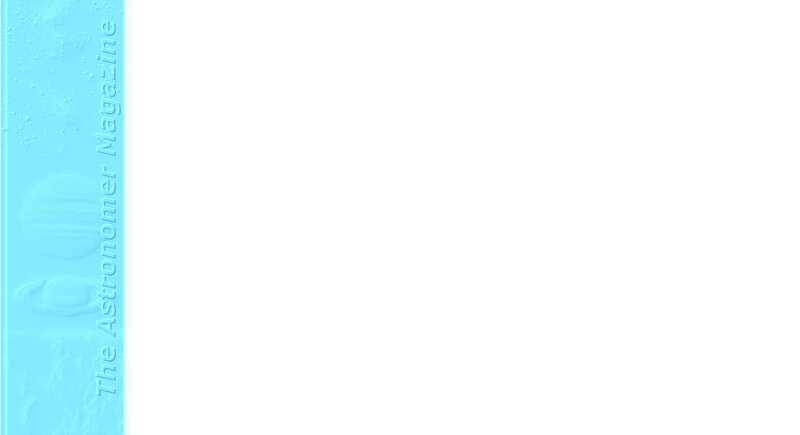 System Longitudes: I = 92.8; II = 260.5. 1999 August 28, 0057. Martin Mobberley, 0.36m, f/25 Cass. 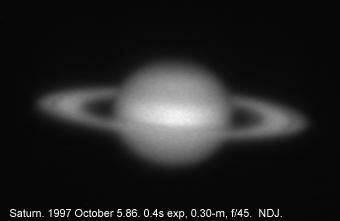 0.2sec, SXL8 CCD. 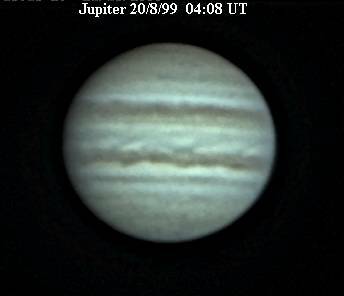 The satellite is Io and its shadow can be seen on the disk. 1999 August 22, 0132. Martin Mobberley, 0.36m, f/25 Cass. 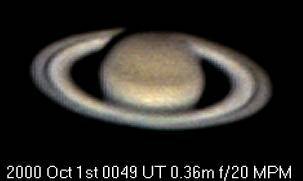 0.2sec, SXL8 CCD. 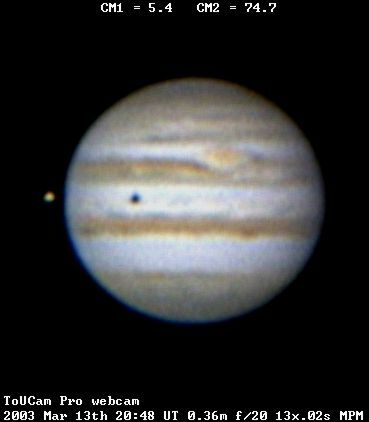 The satellite visible to the right is Io. (CM long 203 deg in Sys I). 1999 August 20, 0408. Terry Platt. 1999 August 21, 0426. Terry Platt. 1998 August 30 0144, Terry Platt, 318mm Tri-Schiefspiegler. (CM long 152.5 deg in Sys II). 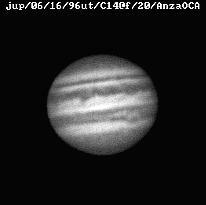 Note the small dark spot in the STZ. 1998 August 19 0248, Terry Platt, 318mm Tri-Schiefspiegler. 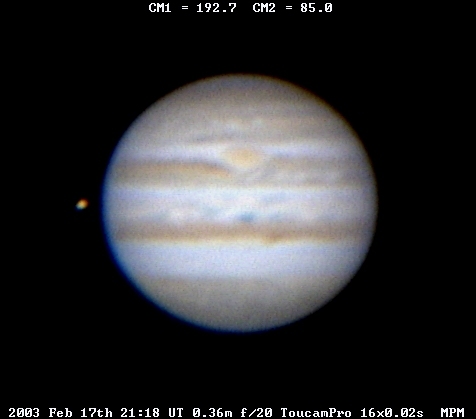 This interesting picture of an occultation of Europa by Ganymede was submitted by Maurice Gavin. 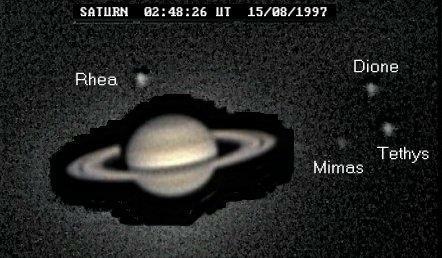 He used a 30cm f/10 Meade LX200 and an MX5-C camera at 23:41 on 1997 July 25. 1996 June 16. John Sandford. 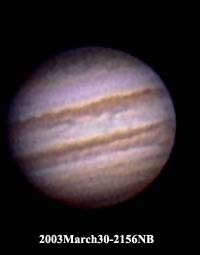 Celestron C14 at f/20. 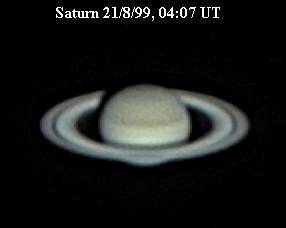 2002 September 28 Stack of 4 images taken between 04:36:05 and 04:36:35 UT during the best seeing. Exposure times were 0.2 seconds; 0.36m f/20 Cass; MX5c. (Mobberley). 2001 December 15, 00:12 UT ; exp 0.2 sec, MX5c colour CCD. 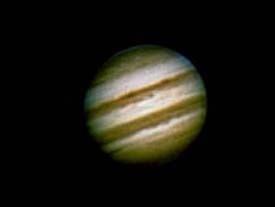 0.36m f/20 Cassegrain (Mobberley). 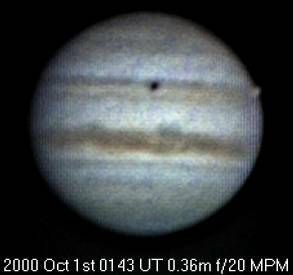 2001 November 3, 0110 UT, exposure 0.2 second, MX5c CCD, 0.36m f/20 Cassegrain. 2000 November 4, 0015 UT, exposure 0.2 second, MX5c CCD. 0.36m f/20 Cassegrain. Martin Mobberley. 2000 October 14 0009. Martin Mobberley. 2000 October 1 0049. Martin Mobberley. 0.36m, f/20 Cas. MX5-C. 0.1 sec. 1999 August 22, 0200. Martin Mobberley, 0.36m, f/25 Cass. 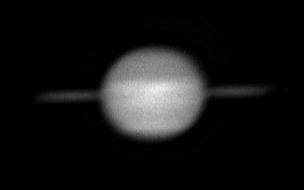 0.8sec, SXL8 CCD. 1999 August 21, 0407. Terry Platt. 1998 August 19, 0302. Terry Platt, 318mm Tri-Schiefspiegler. This is an amazing image! 1997 October 24, 2307. Terry Platt, 318mm Tri-Schiefspiegler. 1997 October 18, 2237. Martin Mobberley, 0.36m Cass. f/40. 1997 October 5, 2038. 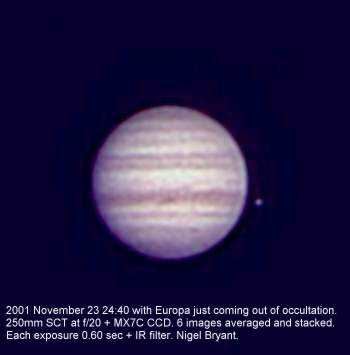 Nick James, 0.3m Newtonian f/45. 1997 August 15, 0248. Terry Platt, 318mm Tri-Schiefspiegler. 1997 August 15, 0230. Terry Platt, 318mm Tri-Schiefspiegler. 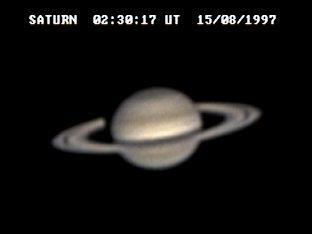 Saturn was an interesting object during 1995 as we passed through the plane of its rings. 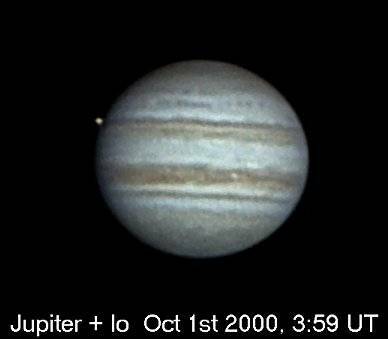 Of particular importance were the numerous mutual satellite events which took place throughout the year. 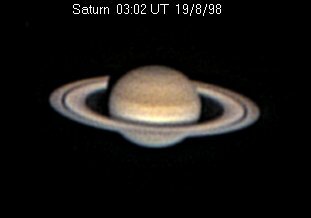 This image was taken on 1995 July 16 just after a Tethys/Dione appulse. 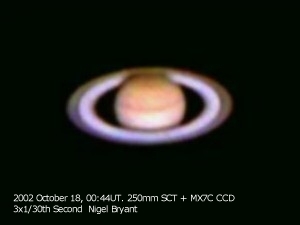 The un-illuminated side of the rings can just be seen extending from the over-exposed globe of Saturn. 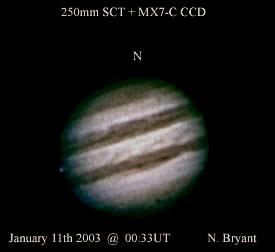 0.30m Newtonian, Sony CCD, Nick James. One of the best mutual events was an annular eclipse of Rhea by Tethys. The predicted duration of this event was 334s centred on 1995 September 24 at 01:16:27UT. 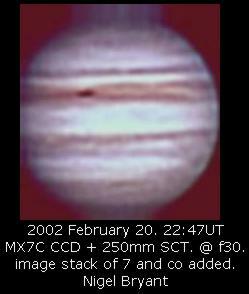 Using a 0.30m Newtonian Nick James obtained a sequence of almost 100 5s CCD images during the event. 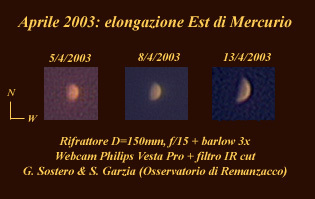 Three of the images are shown in this composite. 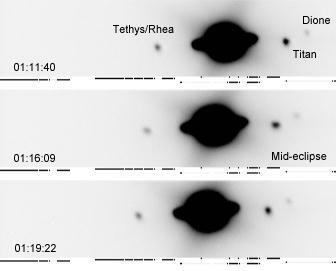 It can be seen that at mid-eclipse the combined image of Thetys and Rhea has faded. A lightcurve obtained from the CCD images shows the eclipse clearly. 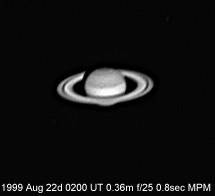 Later in the year Saturn's rings were very prominent as they became illuminated by the Sun. 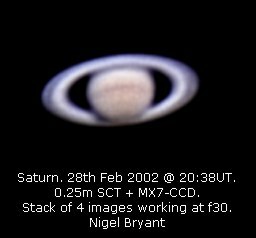 Martin Mobberley's image of Saturn clearly shows the rings and the banded disk. 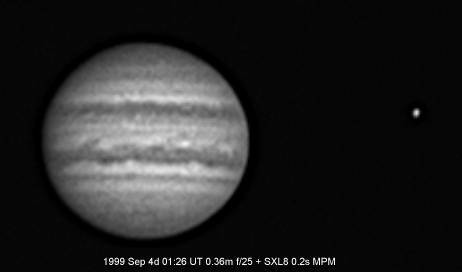 The image was taken on 1995 September 13 at 2206UT using a 0.49m Newtonian projected to f/28 and a Starlight Express CCD camera. North is at the top in this image. The Association of Lunar and Planetary Observers.